A platinum mounted diamond cluster ring, set with a brilliant-cut diamond to the centre, with smaller brilliant cut diamonds set to the cluster and shoulders. Centre diamond weight 0.50cts. An 18ct yellow and white gold mounted solitaire diamond ring having a centre brilliant-cut diamond in a four-claw setting. 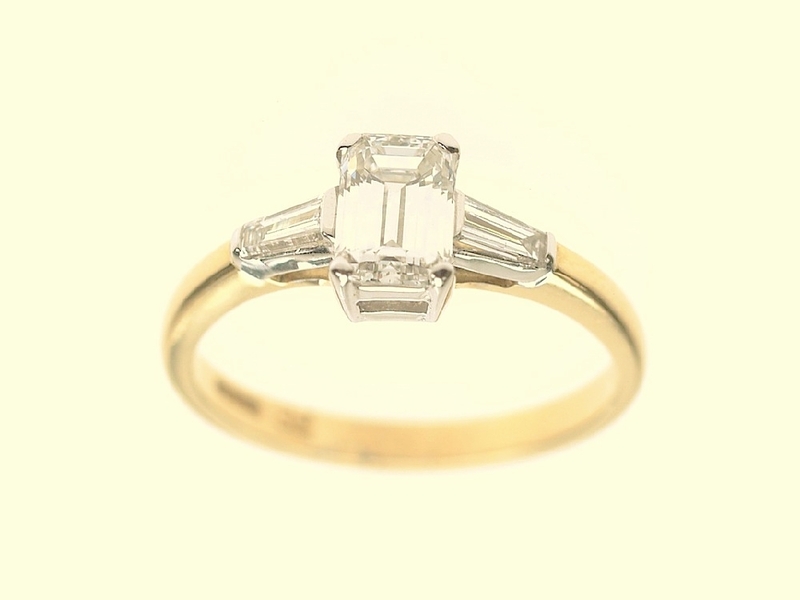 18ct yellow and white gold mounted three stone Diamond Ringconsisting of an emerald-cut Diamond to the centre with a tapered, baguette-cut Diamond to each shoulder. All stones are claw set in white gold and fitted to a plain, polished, D-shaped yellow gold shank. Available from 0.50cts. An all platinum mounted single stone Diamond Ring, having a brilliant-cut Diamond in a 4-claw setting fitted to a plain, polished shank of split shoulder design. Available from 0.15cts. An all platinum mounted diamond 'Halo' ring, set with a brilliant-cut diamond to the centre, surrounded by smaller brilliant cut diamonds and diamond set shoulders. All platinum mounted Diamond Cluster Ring, having four brilliant-cut Diamonds in claw settings fitted to a plain, polished shank of split shoulder design. Available from 0.50cts. A 22ct yellow gold and platinum mounted single stone Diamond Ring by Dawson of Stamford, consisting of an emerald-cut Diamond of 0.37cts in a 22ct yellow gold rubover setting with cutaway sides, fitted to a plain polished shank. An all platinum mounted single stone Diamond Ring having an emerald-cut Diamond in a claw setting fitted to a plain, polished D-shaped shank. Available from 0.25cts. An all platinum mounted single stone Diamond Ring, having a brilliant-cut Diamond in a 6 claw setting fitted to a plain, polished D-shaped shank. Available from 0.20cts. Platinum mounted single stone Diamond Ring having a brilliant-cut Diamond in an eight-claw setting fitted to a plain, polished shank of split shoulder design. Available from 0.15cts.